Game Testing – From the face of it, the job appears quite enjoyable. Playing games whole day and listing out all the bugs from all nooks and corners, as simple as that. Is it only all that? Is it so easy? On a real note, it’s not. The intention behind playing is not entertainment but to identify any weird behaviors in the game, like freeze, crash, glitches or progression blocks. Gaming needs robust software testing as games are usually more complex than other everyday app. Games also target live scenarios and real world at times. While playing a game, any potential bugs, no matter how minor, can ruin the entire gaming experience and make player lose his interest. Each game is carefully analyzed for its features prior to finalizing testing strategy. Games are adapted to suite different platforms. Same game works differently on different platforms and each version of the game may have absolutely unique defects. Massive amount of device and app testing is extremely essential to have a flawless game. Game is also localized to several languages. Game performance should be monitored timely for any leaks. Ad-hoc testing and so on. Last but not the least “FUN”: If a game is not fun, it will not receive good reviews and it could be that no one is around to try the next version. This is the most subjective area of testing, since everyone’s definition of fun varies, but it is also the most important element for which testing is imperative. So testing as an end user during beta testing also stands as a challenge. As a tester “Play and Earn”, but is it only playing? 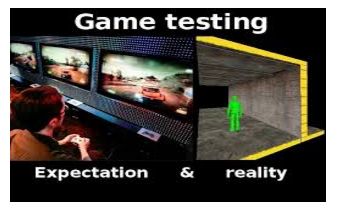 The game testers must be passionate about gaming and have excellent gaming experience to understand how to uncover defects in game application. Finding a bug is not enough, more importantly, correctly classify the severity of the defect and clearly explain it to a programmer is a big challenge. The game tester also needs to show the parts of the game that are working perfectly as intended. Domain expertise is required: Humans are very good at spotting inconsistencies within games related to how realistic are the physics of objects, motion the interactions thereof. If a game does not “feel” right, it may impact ease-of-use. Tolerance to repetitive and tedious tasks. Must be able to play games for long periods. Have knowledge of the requirements of the relevant health and safety legislation and procedures. Detailed oriented observation: Forget about testing if you can’t catch bugs. So to sum up, I would say, Game Developing teams on average, spend more time on testing than any other application development team. 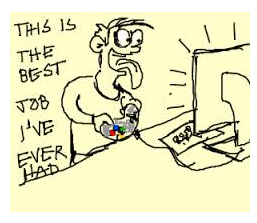 It’s not just any Man’s game, You should be a natural Gamer and have a specific skill set that can fit you into a Game Tester’s soles. I got this game testing experience while working with ProtoTech Solutions for a MNC based gaming company. So do you have an answer for the question, is game testing a piece of cake?